1. Lay down a base of thread from the hook eye to the bend and finish with the thread over the hook point. 2. Select a piece of tail material equal to the length of the hook. Tie in over the hook point and over-wrap back to the hook- bend. 3. Tie in body wrap at the hook bend and transfer thread back to hook eye. 4. Using close wraps but not overlapping, wrap body material around shank back up to 5mm behind the eye, tie off and trim excess. 5. 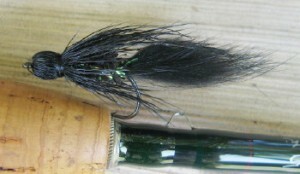 Select a small clump of deer hair, use a hair stacker to even the tips and trim the butts even. 6. With the tips facing forward, attach the butts about 5mm behind the hook eye and over wrap up to the hook eye. Move the thread back to about at least 5mm behind the hook eye. 7. To form the bullet head and the wing, fold the hair back over the tied in butts and secure with six wraps of thread. whip finish and apply a small amount of head cement.